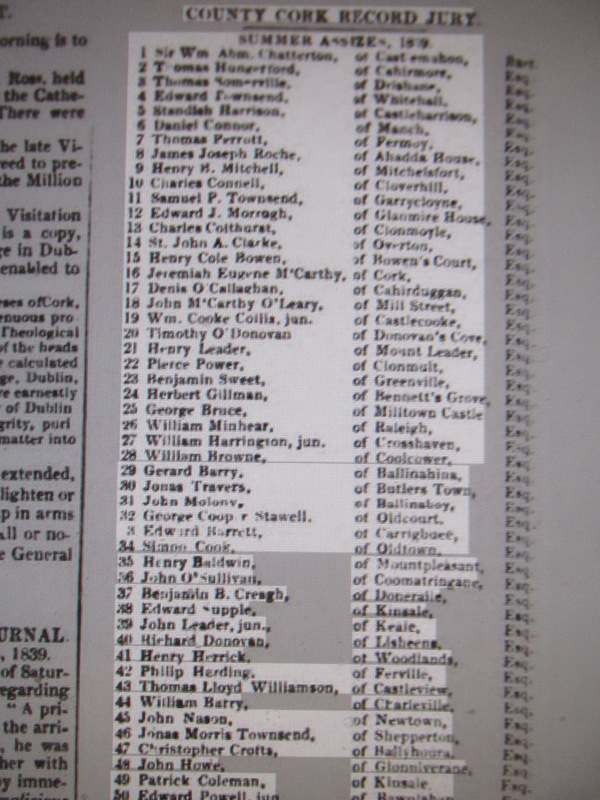 Names and Address Grand Juries, Co. Cork 1839 1839 County Cork Record Jury. Summer Assizes. 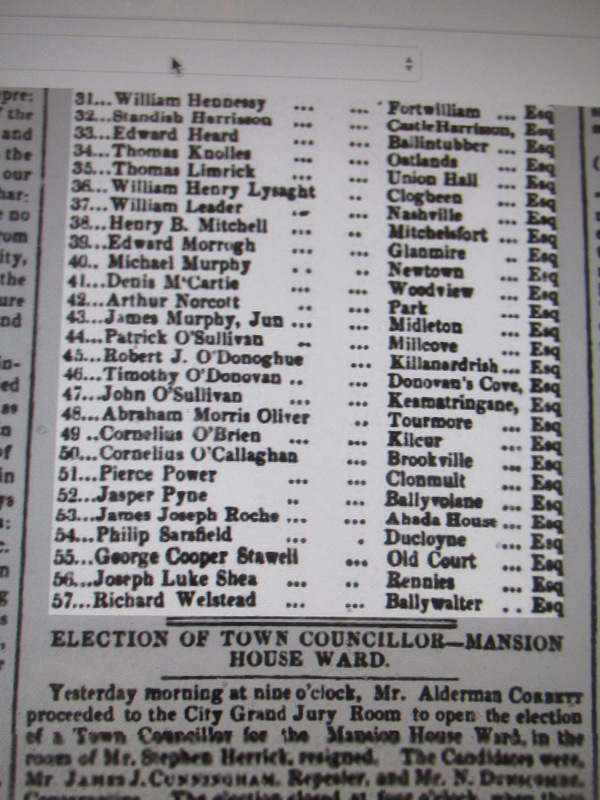 Sir William Abraham Chatterton, Castlemahon, Cork,Thomas Hungerford, Cahirmore, Clonakilty, Thomas Somerville, Drishane, Skibbereen, Edward Townsend, Whitehall, Skibbereen, Standish Harrison Castle Harrison, Charleville, Daniel Connor, Manch, Dunmanway, Thomas Perrott, Fermoy, James Joseph Roche, Aghada House, Midleton, Henry M. Mitchell, Mitchelsfort, Watergrasshill, Charles Connell, Cloverhill, Blackrock, Cork, Samuel P. Townsend, Garrycloyne, Watergrasshill, Edward J. Morrogh, Glanmire House, Charles Colthurst, Clonmoyle, Coachford, St. John A. Clarke, Overton, Bandon, Henry Cole Bowen, Bowen’s Court, Doneraile, Jeremiah Eugene McCarthy, Cork, Denis O’Callaghan, Cahirduggan, Midleton, John McCarthy O’Leary, Millstreet, William Cooke Collis Junior, Castlecook, KIlworth, Timothy O’Donovan, O’Donovan’s Cove, Durrus, Henry Leader, Mount Leader, Charleville, Pierce Power, Clonmult, Fermoy, herbert Gillman, Bennetts Grove, Clonakilty, Benjamin Sweet, Greenville, Bandon, George Bruce, Milltown Castle, Charleville, William MInhear, Raleigh, Macroom, William Harrington junior, Crosshaven, William Brown, Coolcower, Macroom, Jonas Travers, Butlers town, Gerard Barry, Ballinahina, Cork, John Molony, Ballinaboy, Ballinhassig, George Cooper Stawell, Oldcourt, Bandon, Edward Barrett, Carrigbuee, Macroom, Simon Cook, Oldtown, Henry Baldwin, Mount Pleasant, Bandon, John O’Sullivan, Coomatringane, Castletownbere, Benjamin B. Creagh, Doneraile, Edward Supple, Kinsale, John Leade, Junior, Keale, Millstreet, Richard Donovan, Lisheens, Henry Herrick Woodlands, Bandon, Philip Harding, Firville, Macroom, Thomas Lloyd Williamson, Castleview, Fermoy, William Barry, Charleville, John Nason Newtown, Fermoy, Jonas Morris Townsend, Shepperton, Skibbereen, Christopher Crofts, Ballyhoura, John Howe, Glanavirane, Kinsale, Patrick Coleman, KInsale, Edward Purcell Junior, Bawnishal?, and 1840. 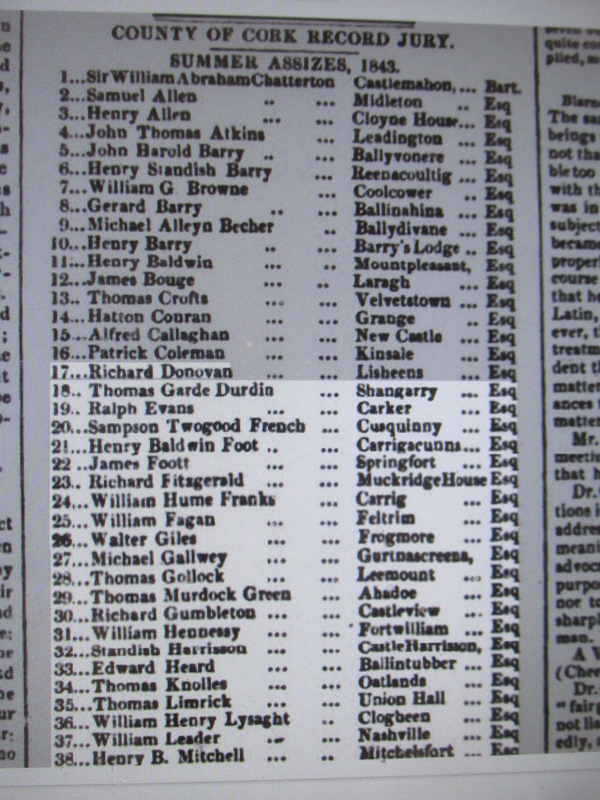 1839 County Cork Record Jury. Summer Assizes.